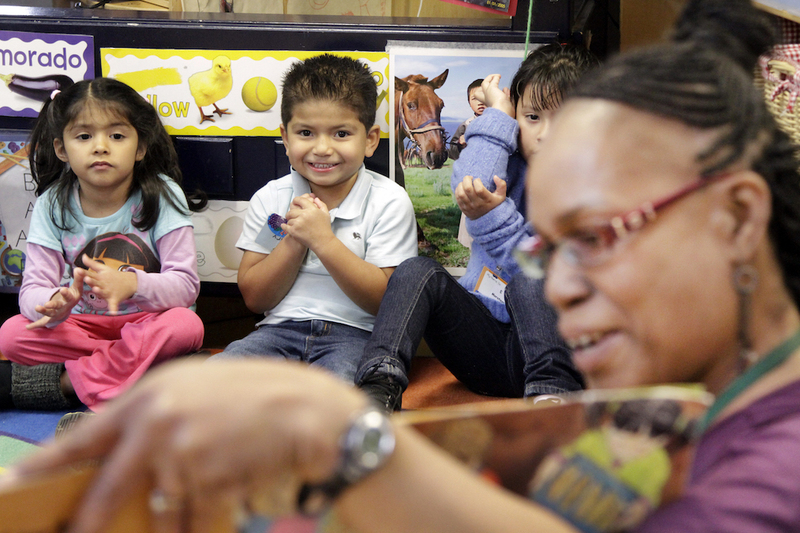 A Los Angeles preschool teacher conducts a class as preschoolers look on, March 2013. States have a critical role to play in expanding access to high-quality early childhood programs to ensure all children have the best start in life. Voters recognize the benefits of quality early childhood programs—including preschool, child care, Head Start programs, and voluntary home visiting programs—and want their elected officials to increase funding to make these programs available to low- and middle-income families.3 Despite this broad support, too many children are currently unable to access the services they need, and too many parents are left scrambling to put together a patchwork of care that meets their families’ needs. Ensure no family pays more than 7 percent of their income for high-quality child care. Make full-day, high-quality preschool available to all 3- and 4-year-olds. Value early educators by paying them a living wage. Support early educators’ access to higher education and early childhood credentials. Give parents more child care options by reducing child care deserts. Use the tax system to increase access to high-quality early childhood programs. End suspensions and expulsions in preschool. Address the school readiness gap by investing in the Early Head Start program. Invest in voluntary home visiting programs so that new parents and their children have the best possible start. Improve supports for parents of children with disabilities and developmental delays. Child care is one of the most significant expenses in a family’s budget and often exceeds the cost of housing or public college tuition.4 The annual price of a child care center surpasses $10,000 per child, putting it out of reach for many low- and middle-income families. In the early childhood sector, this wage board should include government officials; representatives of private-sector early education providers; and organizations representing child care teachers, directors, and other staff. The board should gather input from experts, researchers, advocates, parents, and a diverse group of early educators and child care providers to determine the compensation necessary for educators to be self-sufficient and for the sector to retain a qualified and stable workforce.19 The board would make recommendations to establish a wage ladder and compensation standards tied to increased experience and educational qualifications, which would strengthen workforce retention. Successful high-quality early childhood programs are staffed by experienced and highly skilled teachers. Unfortunately, low wages make it challenging to recruit and retain educators with college degrees or advanced credentials, and there are few financial incentives for early childhood educators to pursue higher education. Scholarships should be sufficient to cover the costs of higher education, including not just tuition but also materials and release time from the classroom. They must also be responsive to the realities of the early childhood workforce by offering programs in the evenings and weekends; providing on-site child care; being located in local communities or offering distance learning; and requiring little to no out-of-pocket costs for educators. Many parents who set out to find child care encounter long waitlists and few choices. According to a recent report, more than half of Americans live in a child care desert, where there are more than three children for every licensed child care slot.21 While child care deserts are a widespread problem, licensed child care is especially scarce in small towns and rural communities. States should include child care facilities when making infrastructure investments. Just as public roads and bridges help parents get to work, child care is a vital component of a modern economy for working families. Because quality early childhood education has been shown to have long-term benefits for children, these investments would have positive effects across generations. Through targeted long-term investment in child care deserts, state agencies can spur economic development in areas that need it most while also providing hardworking families with much-needed relief. The tax credits should be tied to the state’s quality rating improvement system (QRIS) and be designed to increase access to high-quality programs for those who struggle the most to afford it. As such, the provider credit should be tied to the number of child care subsidy-eligible children served as well as the program quality, and the family credit should be fully refundable and offer a higher credit when parents choose high-quality programs. More than 250 preschoolers are suspended or expelled every day across the United States.25 Perhaps most troubling is the fact that exclusionary discipline is applied disproportionately to African American preschoolers, which can potentially extend the school-to-prison pipeline down to our youngest learners.26 Excluding children from school at an early age can create negative associations with learning environments that can have profound impacts on children’s later academic careers. States can address this issue by eliminating exclusionary discipline in preschools.27 New evidence shows that children with disabilities are at the greatest risk of suspension; if states outlaw preschool suspension and expulsion, they will affirm the rights of our most vulnerable students at the earliest stages of learning. States can increase participation in Early Head Start by providing state funds or using flexible federal funds to augment federal resources. Setting a goal of serving all children in families living below the poverty line can be part of a birth-to-college education plan. Bringing a new child home is challenging in even the best circumstances. Many parents face additional stressors—including economic challenges and lack of social support—that can negatively impact their well-being and the well-being of their children.32 Home visiting programs connect these families with nurses, social workers, and other trained professionals who provide families with the coaching and resources necessary to create a healthy home environment. Although each child is unique, the acquisition of specific skills and abilities—known as developmental milestones—typically follow a predictable pattern. When children do not achieve these milestones within the anticipated timeframe, it may be a sign that their development is delayed or disordered. Developmental and behavioral screenings play an important role in the early detection of developmental delays. States should provide home visitors and early childhood teachers with robust training on developmental screenings and allow Medicaid to be billed for screenings. States should also increase funding for early intervention services to guarantee that all children with disabilities or delays receive the required services in a timely manner. These services, which can lead to significant cost savings in the future, can be paid for by expanding Medicaid. Just 3 percent of infants and toddlers nationally receive early intervention services, although research suggests that as much as 13 percent of American infants and toddlers experience developmental delays.37 Even after delays are identified, many children are placed on long waitlists to receive these crucial, high-demand services.38 Increasing funding for screenings, early interventions, and planning—including by providing connections to disability supports and service—can help families identify delays early, access treatment and information about available services, and make informed choices for care. A significant public investment is needed to support a comprehensive early childhood education system that meets the needs of children and their families, early childhood education providers, and early educators. Ideally, states would increase general fund appropriations to address the policies outlined in this report, recognizing that investing in young children is a public good that produces a significant return on investment. Expanding the K-12 funding formula to include preschool and services for infants and toddlers, with funding flowing through local school districts to community providers. Increasing tax rates for high-income earners and identify areas where the tax system disproportionately favors higher-income families and corporations at the expense of services for low-income and middle-class households. For example, states can address corporate tax loopholes, end inefficient corporate subsidies, and consider raising or restoring state estate and inheritance taxes.41 The increased revenue that results from these changes can be directed to support early childhood education initiatives that in turn contribute to the state economy. Research shows that early childhood education is one of the smartest investments states can make, and voters overwhelmingly agree. Supporting new parents and their infants; helping families access high-quality child care that allows them to work and provides their children with developmentally appropriate learning environments; and improving conditions for the predominantly low-income and female early childhood workforce is a win-win for states. The benefits are immediate, long-term, and apply to children, families, and the state’s economy. It is time to view investments in early childhood in the same light as other economic development investments. Building a comprehensive early childhood system that addresses the multiple needs identified in this report can help grow states’ economies and develop the workforce of the future. In the absence of federal leadership, states have a prime opportunity to lead on this issue. The policy ideas laid out in this report provide a roadmap for taking bold action to support all families in 2018 and beyond. Simon Workman is the associate director for Early Childhood Policy at the Center for American Progress. Katie Hamm is the vice president for Early Childhood Policy at the Center. Rasheed Malik is a senior policy analyst for Early Childhood Policy at the Center.